TCP stands for Transmission Control Protocol. This may be one of the most common protocols in relation to any IP network. For example, most of the application layer protocol we are commonly using these days , like HTTP, HTTPS, SMTP, POP3, IMAP, SSH, FTP, Telnet ect, are typically encapsulated in TCP packet. TCP is a kind of session protocol which requires a special procedure to establish the connnection between the client and server and also requires a special procedure to release the connection between them. 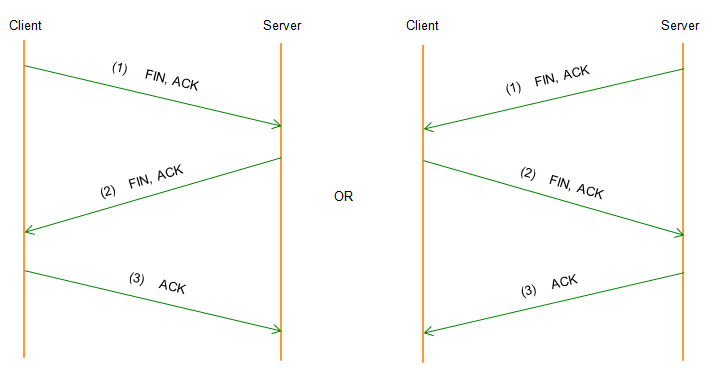 To begin the communication using TCP, the client and server has to go through a special sequence to establish the connection and this sequence goes as shown below. It is done by 3 steps. That's why this procedure is often called 3 way handshaking or 3 way negotiation. Step (1) : Client send a TCP SYN Packet to server to request connection establishment. At this step, the client assign a specific sequence number (this is called as ISN) as the initial (first) sequence number. This is not zero, it is the number generated by a special algorithm in such a way that it cannot easily been guessed by any intruder. As you see in the following example, the real initial sequence number is randomly (specially) assigned as in (C), but in wireshark it is labeled to be 0 as shown in (A). Also, this initial packet has SYN flag is set to be '1'. 0000 00 30 64 0b 6c 69 00 00 91 05 fa 92 86 dd 60 00 .0d.li........`. Step (2) : Server accept the SYN request and send ACK and SYN in a single packet to the Client. At this step, the Server assign a specific sequence number (this is called as ISN) as the initial (first) sequence number. This is not zero, it is the number generated by a special algorithm in such a way that it cannot easily been guessed by any intruder. As you see in the following example, the real initial sequence number is randomly (specially) assigned as in (E), but in wireshark it is labeled to be 0 as shown in (A). 0000 00 00 91 05 fa 92 00 30 64 0b 6c 69 86 dd 60 00 .......0d.li..`. 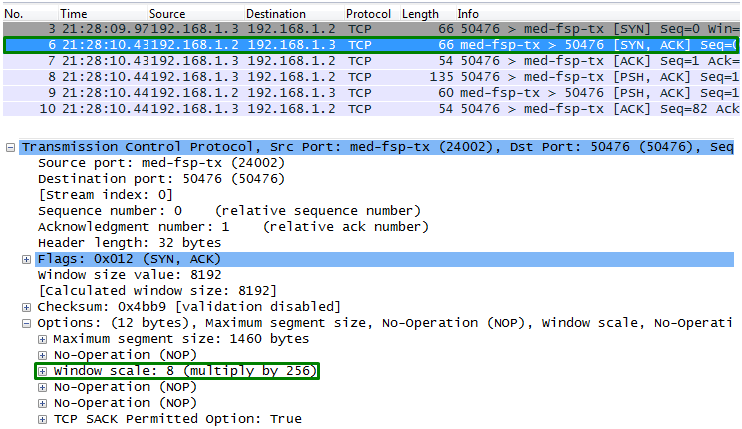 Step (3) : Now the client send ACK to the Server for the SYN packet. You see here both Sequence Number and Acknowledgement number got incremented by 1. 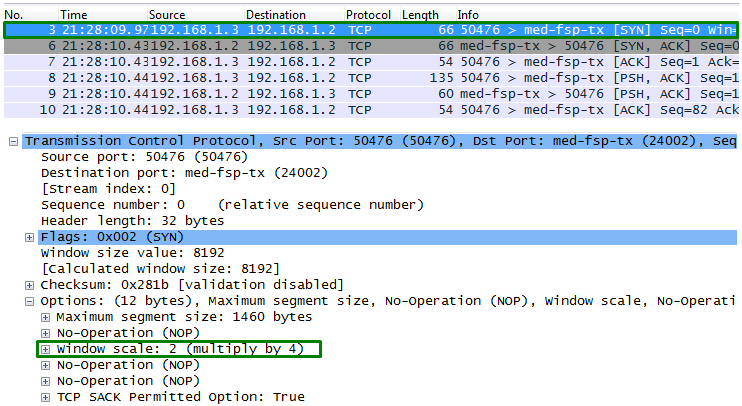 The type and the property of a TCP packet is determined by various flags located in the TCP header. Some of the important flags are listed below. RESET Indicate some error (e.g, unexpected packet) occurred and Abort the connection. Indicate "This is a packet for Synchronization (TCP Establishment) process"
FINish Indicate "This is a packet for Finish (TCP Release) process"
In TCP header, there is a important field named as Window Size as shown below. It indicate the amount of space (in byte) left in the receiving buffer. Basically it notifies the other party "I have this much of space in my receiving buffer, so you can send that amout of data to me at maximum". In other words, "Don't send me the data more than that". What if this window size is set to be 0 ? What does it mean ? It means "I have no space to receive any further data. So don't send me any data to me now". As you may guess, this window size would be very important indicator for traffic flow control.. so is used as very important indicator for troubleshooting various TCP related issues. There are various ways to change this window size adaptively and followings are some of the web posts that may be helpful for you. 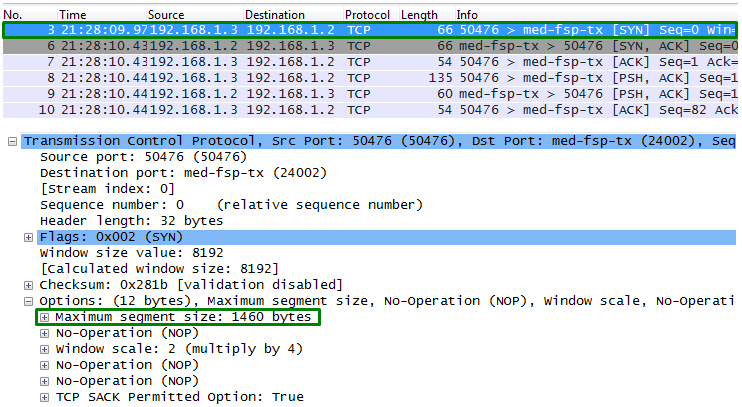 TCP Window Size is represented by a 16 bit number. It means that the maximum window size that can be represented is 64 K. What if we need to represent a window size larger than 64 K ? It cannot be reprented by the 16 bit number. To overcome this restriction, they come out with an option field called 'Window Scale'. If 'Window Scale' field is set, the real window size is calculated by as follows. Window Scale can be set independantly for Client and Server. 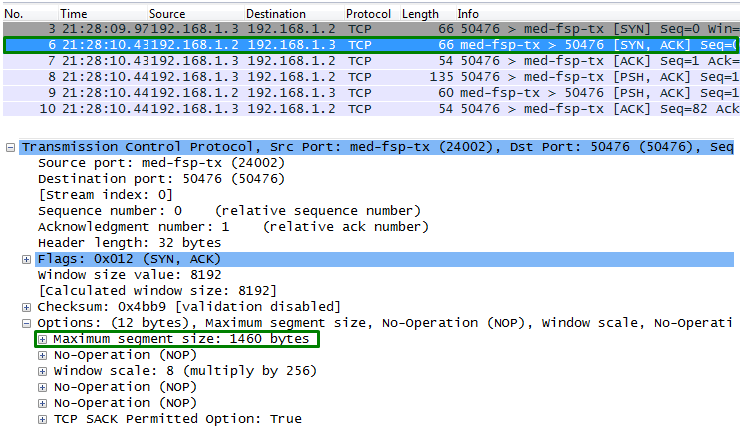 Window Scale for Client can be set by SYN packet as shown below. Window Scale for Server can be set by SYN,ACK packet as shown below. MSS represent the maximum size of a TCP packet. This size can be configured differently on Client and Server and the size information is exchanged by [SYN] and [SYN,ACK] packet as shown below. One thumb rule to set the MSS is to set it to be (MTU - 40) bytes. MTU is a kind of maximum packet size for each network card. So if you set MSS too large and the whole IP packet gets larger than MTU, it should be fragmented into multiple packets to make it fit to physical packet limitation and it may influence negatively on TCP throughput. Just for your reference, you can figure out MTU of each of your network card by using following command if you are using Windows.